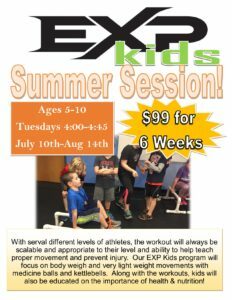 EXP Kids Summer Session starts TUESDAY!! EXP Kids introduces the foundation of fitness in a fun environment! Our Summer Session will run Tuesdays from 4:00-4:45pm for ages 5-10 years old July 10th-August 14th. A great way to keep your kids active this summer!